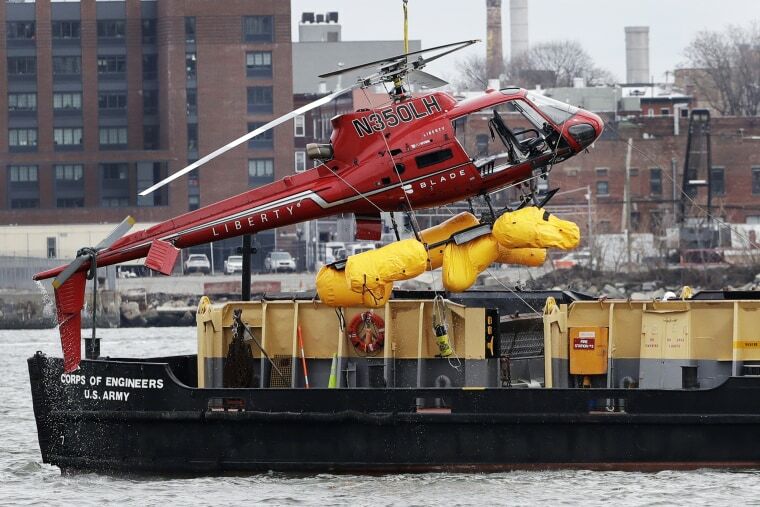 The pilot of a helicopter that crashed into New York City’s East River during a private photo tour on Sunday declared an engine failure moments before the aircraft plunged into the water, killing all five passengers, federal officials said Monday. A senior law enforcement official earlier told NBC New York that the pilot, who survived the crash, speculated in an interview that one of the passengers may have accidentally hit the chopper’s fuel cut-off switch, causing the accident. During a Monday news conference, National Transportation Safety Board member Bella Dinh-Zarr and investigator Todd Gunther said they’d never heard of a passenger tripping a cut-off switch. “That’s something we’re looking into,” Gunther said. Dihn-Zarr said federal investigators hadn’t yet spoken to the pilot — who sources earlier identified as 33-year-old Richard Vance — nor had they examined his background. Dihn-Zarr added that they planned to look into whether the Airbus Eurocopter had a history of mechanical problems. Asked if there was a problem with the aircraft’s floats, which are attached to its skids and are meant to prevent helicopters from flipping over, Gunther said the devices deployed but it was unclear if they’d been properly maintained. Earlier Monday, New York Sen. Chuck Schumer called on the Federal Aviation Administration to temporarily ban the chopper’s operator, Liberty Helicopters, from flying. Citing three crashes within roughly a decade, the lawmaker said the company’s FAA certificate should be suspended while its safety record is scrutinized and the latest incident is investigated. In a statement, the department said it was conducting its own investigation to determine “whether the operation was compliant” with federal regulations. A review of FAA records shows that there were no fatal injuries in accidents between 2010 and last year. Liberty said in a statement that it was focused on supporting victims’ families and cooperating with federal authorities. Video footage showed the Liberty chopper careening into the water shortly after 7 p.m. with its propellers still spinning. Moment later, the aircraft flipped over. Vance was able to escape and appears to have been rescued by passing tugboat. Divers were then dispatched to rescue the remaining passengers, all of whom were buckled in with harnesses and had to be cut out of the upside-down aircraft in 50 feet of water, New York City Fire Commissioner Daniel Nigro said Sunday. “It’s a great tragedy that we had occur here on an otherwise quiet Sunday evening,” Nigro said. Two passengers were pronounced dead at the scene on Sunday. The remaining three, who had been hospitalized, were all declared dead early Monday morning. Tristan Hill, 29, and a 29-year-old Argentine tourist, Carla Vallejos Blanco, died in the crash, NBC New York reported. Daniel Thompson, a 34-year-old singer and president of the non-profit Young New Yorkers' Chorus, was also among the dead, according to an official with the group, as were two 26-year-old friends from Texas, Trevor Cadigan and Brian McDaniel. McDaniel was a firefighter in Dallas who’d gone to high school with Cadigan and was in New York visiting him over the weekend, NBC Dallas-Fort Worth reported. In a brief video posted on Cadigan’s Instagram account, the pair can be seen sitting in the chopper as it appears to lift off. As Cadigan grins widely into the camera, he angles his phone to show McDaniel sitting just behind him. He smiles, holds up his thumb and sticks out his tongue.